Mostly cloudy. Slight chance of a rain shower. Low 44F. Winds E at 5 to 10 mph. 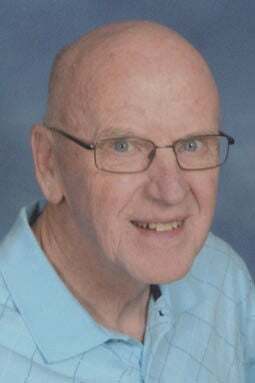 Ronald A. Overbeck, 75, of Beatrice died Monday, June 19, 2017 at a Lincoln hospital. He was born on October 20, 1941 in Beatrice. He graduated from Beatrice High School in 1959 and attended the Lincoln School of Commerce in 1962. He married Arlene Schmidt on October 24, 1965 at St. Paul's Lutheran Church in Beatrice. He served with the Army National Guard from 1963 until 1969. He worked at Production Credit of Beatrice and then at Store Kraft as manager of the cost department for 43 years. He also farmed all of his life. He was a member of Holy Cross Lutheran Church of Beatrice and several camping clubs. He enjoyed woodworking, but loved farming. Survivors include his wife, Arlene, of Beatrice; his son, Larry Overbeck and wife, Karyn, of Omaha; his two daughters, Carol Sueper of Beatrice and Nancy Brewer and husband, Jason, of Gretna; his 12 grandchildren, Rachel Overbeck of Boston; Jacob, Anna and Sarah Overbeck, all of Omaha; Colin, Devin and Jenna Brewer, all of Gretna; Evan, Grant, Luke, Maxwell and Gabriel Sueper, all of Beatrice; his brother, Dale Overbeck and wife, Betty, of Beatrice; his sister, Karen Overbeck Koch and husband, Daryl, of Mesa, Ariz.; as well as several of his nieces and nephews. He was preceded in death by his parents, Albert and Elsie Hasenohr Overbeck, his infant sister, Janice, and his in-laws, Louis and Anna Wallman Schmidt. Memorial services will be held at 11 a.m. on Friday, June 23, 2017 at Holy Cross Lutheran Church of Beatrice, with Pastor Kathee Forrest officiating. Inurnment of the cremains will be held at a later date. A family prayer service will take place at 10:45 a.m. on Friday at the church. In lieu of flowers, a memorial has been established to the family's choice, with Terri Huls and Rondi Mettscher in charge. Cremation has taken place and there will be no viewing, but a register book will be available at the Fox Funeral Home from 8 a.m. until 9 p.m. on Thursday. The family will meet and greet relatives and friends on Thursday from 6 p.m. until 8 p.m. at the funeral home. Visit www.foxfuneralhome.net. Fox Funeral Home is in charge of the arrangements.